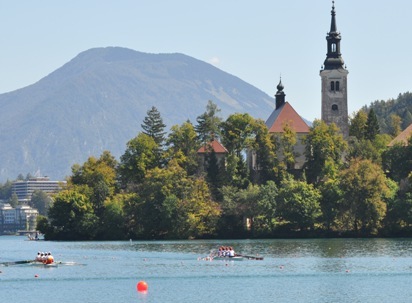 Erynn and I have wanted to go to the Bled World Rowing Championships ever since we saw the crazy people campaigning for the city's selection at the 2007 Munich World Champs (scroll down a bit). 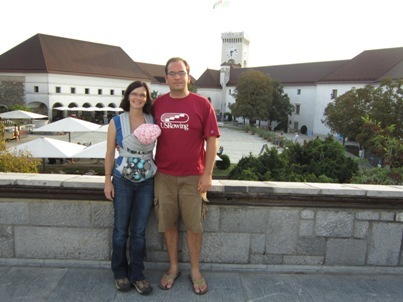 We even booked our hotel room in Bled the year before while watching the World Champs in New Zealand. Needless to see we like watching the Rowing World Championships. It's usually a fun atmosphere and you can't beat the locations! This year's race was our 6th event and Greta's first. However, when we originally planned on attending we didn't know we would be living in Germany. According to Google Maps the trip from Mannheim is just over 8 hours to Bled. So we decided to drive there since it's also much easier to pack and carry everything you need for a newborn in a car vs. a plane. But hey! 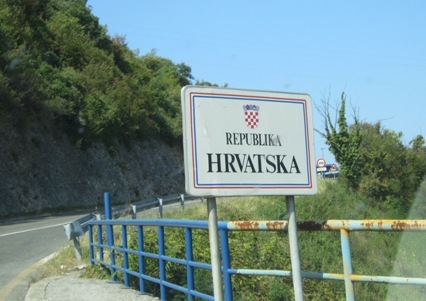 Since we were driving we also decided to make a week of it and tour the northern Adriatic region. 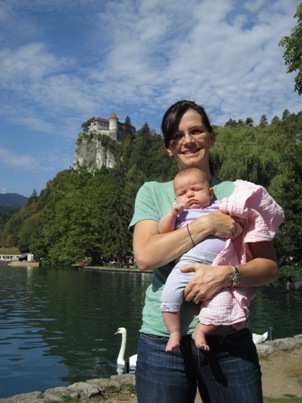 Within a couple hours of Bled are some really cool places in Italy and Croatia along with the splendor of the Julian Alps and Bled. 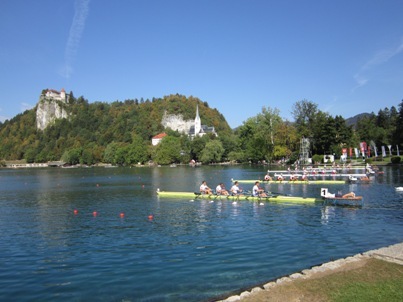 It was fun with the week -- starting with rowing (Doug racing) and ending with rowing (watching the World Champs in Slovenia). 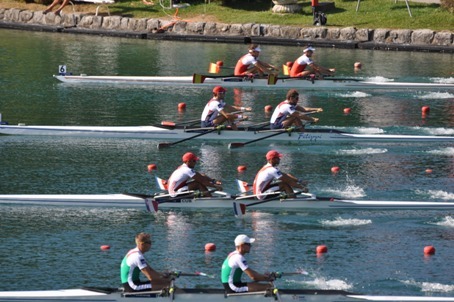 In the photo above you can see the Men's Quadruple Scull from Mannheimer Ruder-Club taking gold (notice the smiles). 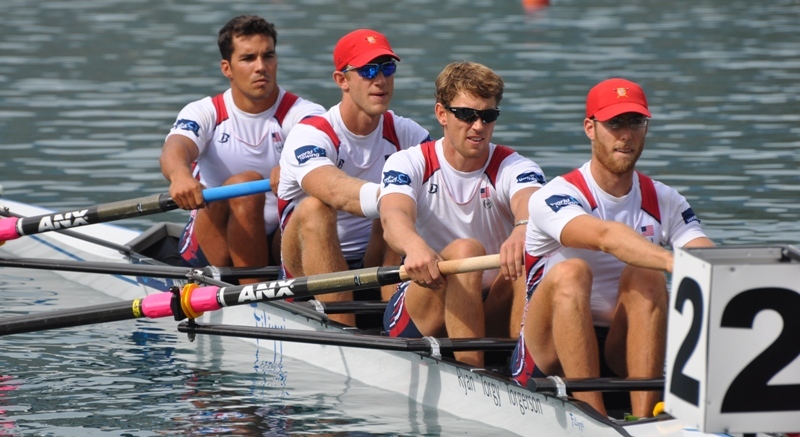 In the boat are Dirk (bow), Doug (2), Thomas (3) and Johannes (stroke). In the left photo you see the guys from the Quad: Thomas, Doug, Jonannes and Dirk. And in the right photo Erynn is with Greta in front of the Mühlheimer Ruderverein (Mühlheim Rowing Association). I think Greta enjoyed her first regatta experience... there may be many more in her future. Click Here for all of the high resolution photos from the regatta. 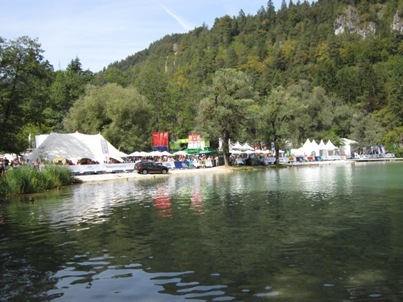 After the Sunday regatta in Mühlheim, we drove half way to Italy and stayed overnight in Grödig, Österreich (Austria). We picked a cute little hotel just outside of Salzburg, and we liked the hotel and area very much. We had been to Salzburg before and didn't really stick around when we woke up. But as you can see from just these couple photos it's a pretty area. 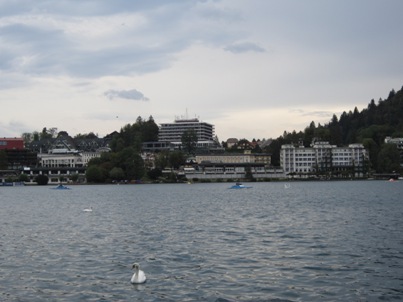 And we would recommend the Hotel Gasthof Mostwastl. Nice rooms, friendly staff, you can book online easily, and the breakfast was included and not too bad. Our destination from Austria was Trieste after driving through the Austrian Alps. However, the guidebook said that the small town of Udine was often overlooked and a nice stop along the way. Plus the timing worked out well for us to grab lunch. The main sites in the town are the Piazza Della Liberta (left picture) and the cathedral (Duomo) shown on the right. Although the picture of the Duomo is better since the shadows on the Piazza were not ideal for a decent photo. The thing we most look forward to in Italy is the food. Even train station food is better than most of what you get elsewhere. And our lunch in Udine did not disappoint. For pre-eating we stopped at a little gelato place and Erynn really enjoyed her little cup of chocolate gelato. We then hit a little cafe called Antica Osteria Al Fagiano. You can see from the right picture that I had prosciutto and melon and Erynn had the Caprese salad. Take a look at the buffala mozzarella! It's as big as Greta's head... and it was amazing! Driving south from Udine and off the highway we stopped at this overlook a few miles from Trieste. The view wasn't super dramatic, but it was our first look at the Adriatic Sea. Erynn even took a picture of me to prove I made the trip! After settling into our hotel, we took a little stroll along the Trieste waterfront and through town a bit. 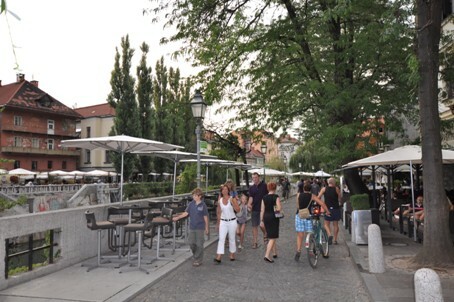 The focal point for the town and water front is the Piazza dell'Unita d'Italia (Square of Italian Unity). Another lovely feature of Trieste is the Grand Canal just to the west of the Piazza dell'Unita d'Italia. It is now really just a small pool of water in between two rows of buildings and is only about 500m long. But it is sure pretty as you can see from the photos (taken from each end of the canal). That night we even grabbed a quick pizza at one of the many restaurants lining the edge. Sehr schön. After walking around town a little bit we decided to walk up the hill overlooking the city. On top of the hill is a nice park, a citadel and a beautiful church... along with nice views of the city and sea. The above photos are from the Parco de la Remembranza at the top of the hill overlooking the city. They climb in the heat was pretty intense so we found a lovely bench and relaxed for a bit by this fountain. The Basilica di San Giusto and the citadel dominate the top of the hill overlooking Trieste. The basilica is fairly modest on the outside in my opinion, but the interior is amazing. The mosaic about the alter sparkled in the sunlight. Some views from the top of the hill (Colle di San Giusto). Left: Erynn and Greta overlooking the Adriatic Sea. To finish up the Colle di San Giusto photo series are a picture of the fort/citadel and a pretty picture of a statue that Erynn liked very much. It was a beautiful day. After hiking back down the hill, we had dinner by the Grand Canal until sunset. Greta was getting grumpy so Erynn headed back to the hotel. Before the trip I had been reading this web site by Ken Rockwell about taking great sunset photos. So after dinner I decided to play around a bit. You already saw the Grand Canal sunset picture a few photos ago. But before that I went into the Piazza dell'Unita d'Italia and took a bunch of photos of the City Hall. The top photo shows the City Hall during the day when we were in the square. Then as the sun was setting I took about 50 photos every few seconds from the same spot. Same camera settings and everything. The only thing that changed was the time. The Ken Rockwell site describes the timing of the sunset color pop. In the three photo sequence you can see the subtle change in color. Aside from resizing the photo there was no other editing. If you would like to see the originals click here. The first photo was taken at 08:16:39 PM before the color pop. The second photo with the color pop was taken at 08:16:47 PM. The third photo after the color pop was at 08:17:06 PM. The total difference was 27 seconds between all three photos and you can see the difference in color. I still have a ton to learn regarding camera settings, filters, etc. to get even better sunset photos, but I thought it was pretty cool for my first try! The next morning we decided to head out to the Miramare Castle a couple miles outside of Trieste before heading to Croatia. We stopped to get a few photos along the waterfront (shown above) and then decided not to go all of the way to the castle. You can see the castle as the small white building on the peninsula in the distance. The traffic was bad and we were anxious to get to Croatia so we'll save the castle for the next visit. While we were stopped we also saw a small flotilla of scullers out on the Adriatic. Very cool to see. 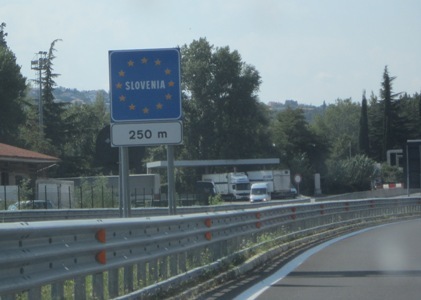 Sometimes Erynn and I just pinch ourselves when we do things like drive from our home to the border of Slovenia and Croatia. And yes, we did get passport stamps! 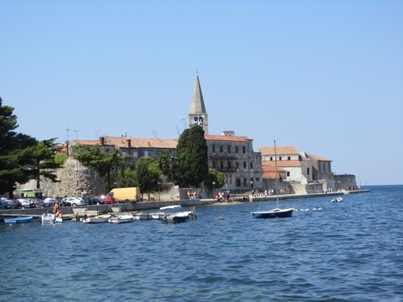 Our ultimate destination in Croatia was Pula on the tip of the Istrian Peninsula. 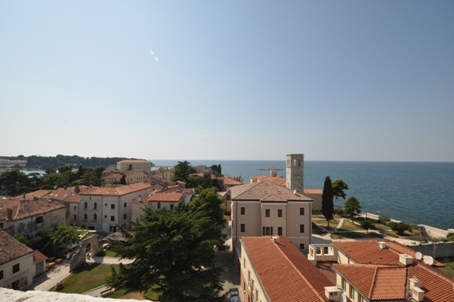 About half way down the coast from the Slovenian border is a cute little town called Poreč. 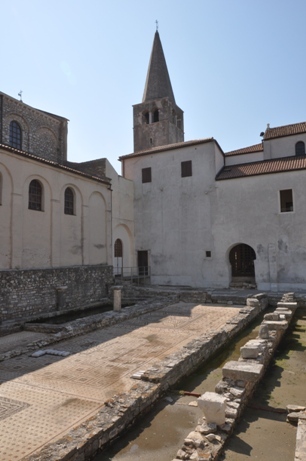 The whole old town is on a tiny peninsula sticking out in the Adriatic Sea and features an UNESCO World Heritage Site -- the Euphrasian Basilica. The pictures above show the town skyline as you walk into town from the main parking lot. You can see the bell tower of the Euphrasian Basilica in the distance. In the right photo you see Erynn and Greta in the Trg Slobode (aka Liberty Square). We took the guide book advice and ate at the Dva Ferala Restaurant on the harbor side of town. The food, service and atmosphere were great. It was a very warm day and Greta enjoyed her beach wear. Besides the food and the nice walk along the waterfront, the highlight really was the Euphrasian Basilica. Parts of the structure date from the 6th century! 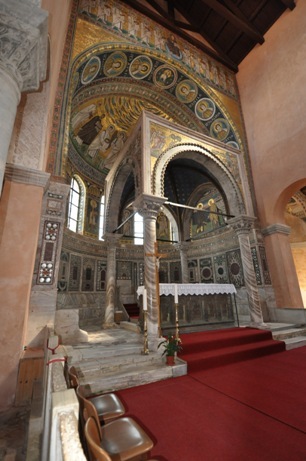 The courtyard and building in the middle picture houses a number of 6th century mosaics, and the Ciborium (right photo) has the Mosaic with Mother Mary and Child. There really are a ton more photos of the church here if you'd like to take a look. It isn't a day on vacation with the Rathburns if it doesn't include climbing a bunch of stairs or a large hill. Therefore, to keep up the tradition I climbed the bell tower to get a look of town. Above are the four shots I took from the four sides of the bell tower: Top Left = North, Top Right = East, Bottom Left = South, and Bottom Right = West. 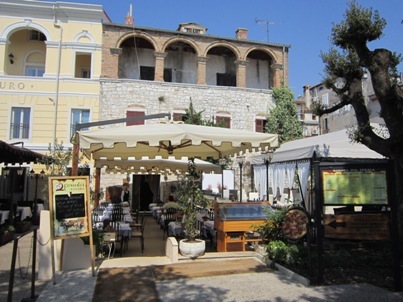 We spent two nights in Pula at the Hotel Histria on the Verudela Peninsula. 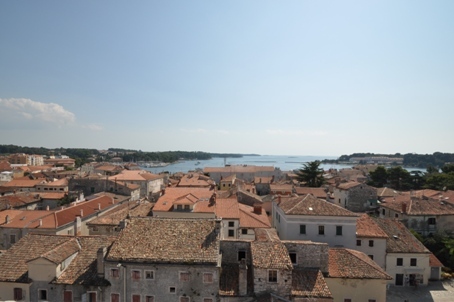 The hotel is only a few kilometers from the Pula city centre and is part of a complex owned by the Arena Turist Group. The area was nice and on the verge of being a concrete block mega resort, but somehow not quite. The rooms were big with private balconies, but a bit dated, and breakfast was pretty good. There were a bunch of restaurants near by that served some local food in a casual environment. All in all I don't think we'd give the Verudela area a raving review, but it was bad either. The pool was saltwater and not very warm, which is why we have a picture of Greta near the water. We put her toe in the water and she screamed like we never heard her scream previously. 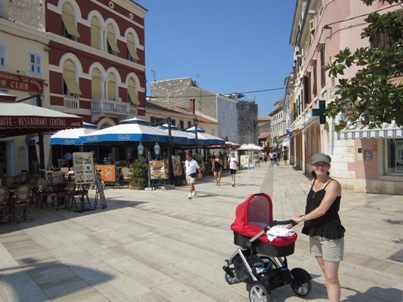 Certainly the tourist "draw" for Pula is the sea and the old town. The old town has an impressive and well preserved Roman amphitheatre. According to Wikipedia, "it was constructed in 27 BC - 68 AD and is among the six largest surviving Roman arenas in the World." Because there was a hill, we decided to climb it... 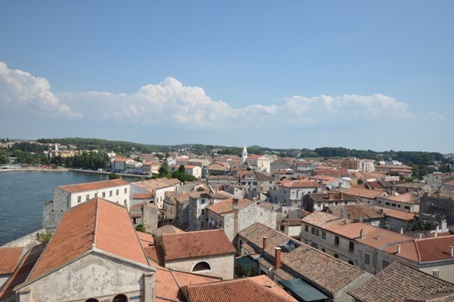 In the center of Pula is a hill with a fortification on top. It promised stunning views of the city, but the angles weren't ideal. Here you can see the entrance to the citadel and also a photo from the inside on top of the wall. You can see the Pula Arena behind Erynn and Greta partially hidden by other buildings. I guess the hill just needed to be a bit higher. I would say the thing we were most excited about was the change to swim in the sea and relax on the beach. However, all of the beaches in the area we rock beaches. As you can see from the photos that doesn't mean large gravel beaches. It means every surface is hard, jagged, and not flat beaches. Plus for the end of August the water was not terribly warm. Certainly not warm enough for Greta even though the air temperatures were quite high. 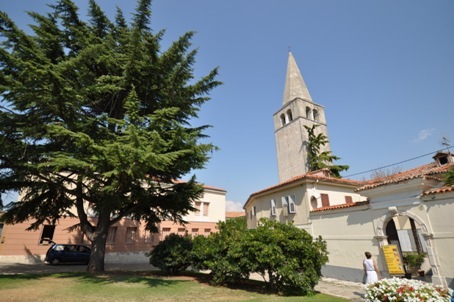 About 20 minutes south of Pula on the very tip of the Istrian Peninsula is Kamenjak Park. Inside the park are dirt roads and beaches (see definition above). I think the best part was the drive into the beach and the fun on the dirt roads. Our poor car paid the price and was covered in fine dust for days. 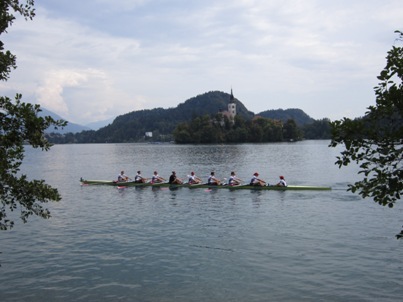 The main reason for our trip was to end up in Bled to watch the World Rowing Championships. We met up with our friends Patrick and Miren from England and settled in to a fun four days. 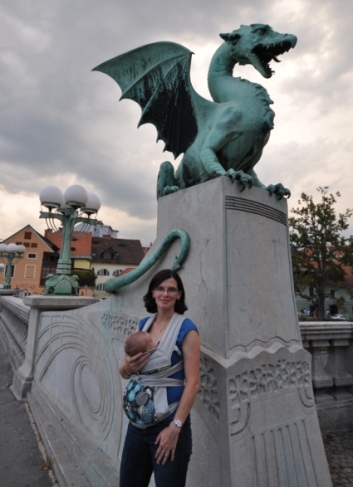 As I mentioned before, Bled was our 6th World Championships and our fourth with Patrick and Miren. You can see those trips reports from Seville 2002, Eton 2006, and Munich 2007 by clicking on the links. 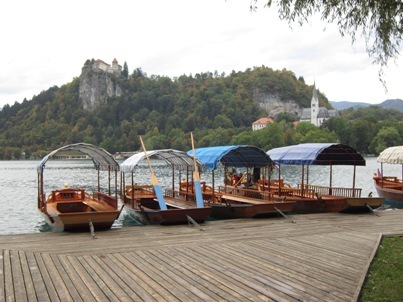 The town of Bled is really picturesque. 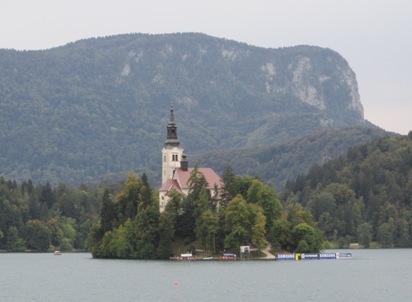 Overlooking the lake is Bled Castle, and in the middle of the lake is a small island with a church. I think everyone, me included, takes a ton of photos of these two buildings. You'll have to check out the photo album to see the rest. The venue was the best ever. You could get really close to the action and walk the entire course. The only real downside was that the grandstands (left photo) were exposed to full sun all day. So with a mew born we mostly hung out at the end of the course (looking up the lanes) or at the starting line. You can see the area in the right photo. I've never been able to get close to the start like this so it was pretty fascinating. Here are some shots from the starting line area. 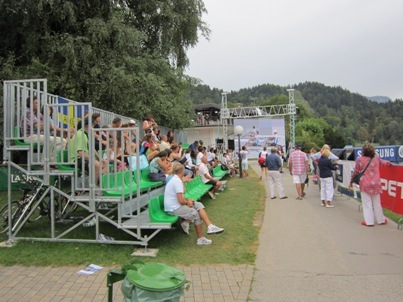 You could get within a few yards of some of the crews, and there was even a small grandstand with its own video display. 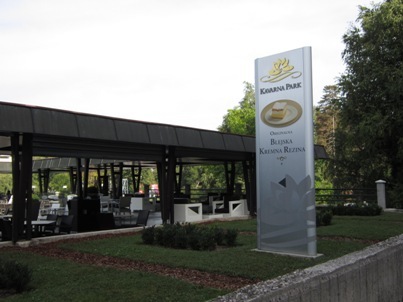 The other bonus for the starting line is the Kavarna Park Restaurant, which is famous for its Cream Cake. We ate there a couple times (worth it) and for the view of the course. You can see in the right photo the view of the start from the restaurant. 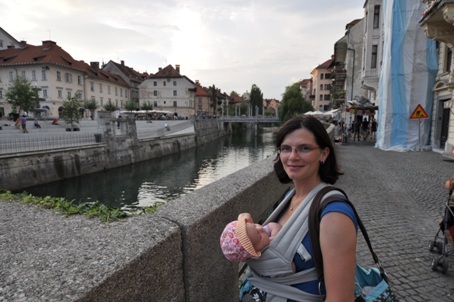 One evening after watching rowing we drove the 30 minutes into Ljubljana to check out the city centre. 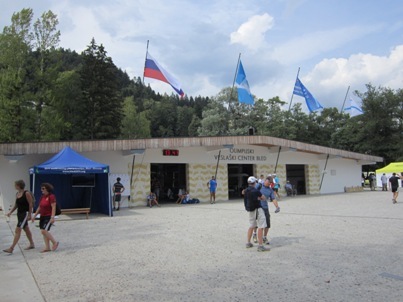 We weren't disappointed and came away thinking it was one of our favorite centers in Europe. It's absolutely beautiful and just the right size. 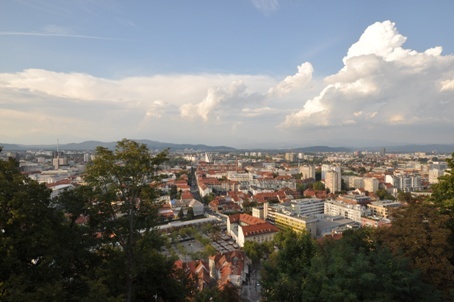 After parking the car we headed up the funicular to Ljubljana Castle. 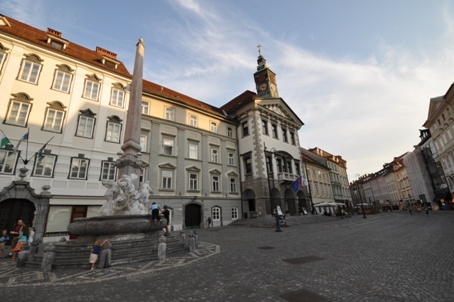 One of the prettiest squares in Ljubljana is Mestni Trg. 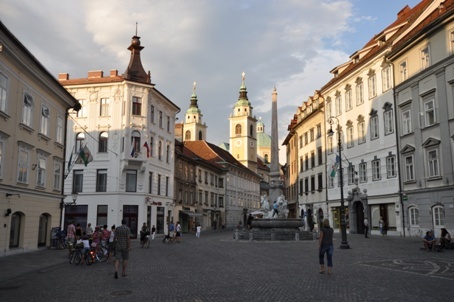 In the left photo you can see the Robba Fountain with St. Nicholas Cathedral in the background. In the right photo is Robba Fountain with Town Hall in the background. 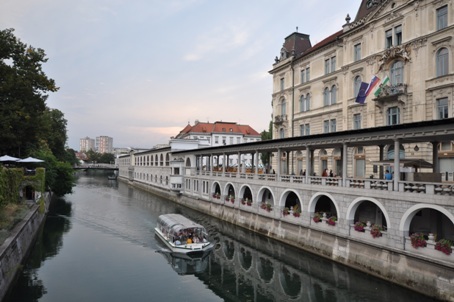 The scene along the Ljubljanica River was pretty great. There were a bunch of cafes and restaurants lining the waterfront, and by all accounts the amount of EU money flowing helped do a bunch of face-lifting. The next result was pretty cool. The other cool, main square was Prešernov Trg. 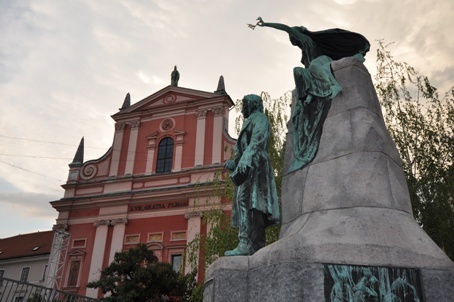 Prominent features in the square are the pink Franciscan Church of the Annunciation and the Prešeren Monument captured in the right photo. The light wasn't quite right to get a great photo. Plus they were setting up a music stage in front of the church which prevented a better angle. Oh well... I guess we'll have to go back!!! Walking back to the car I snapped a nice photo of the river and Erynn and Greta standing next to a dragon -- one of the city's symbols. 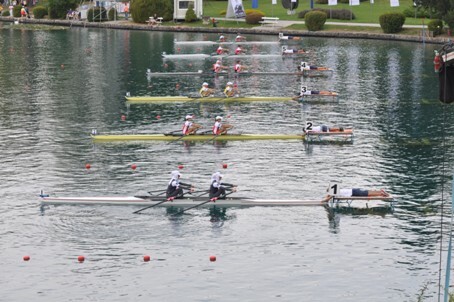 Our first ever World Rowing Championship experience was the 1999 event in St. Catharines, Canada. On a lark we drove up from Cleveland and had a great time. 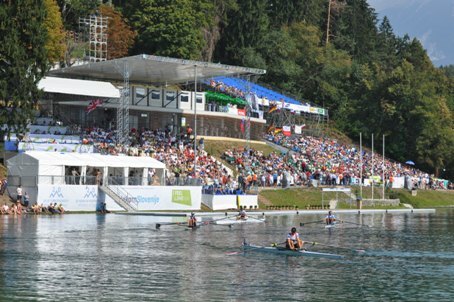 The Worlds held before an Olympic year serves as a qualification regatta for the Olympics. 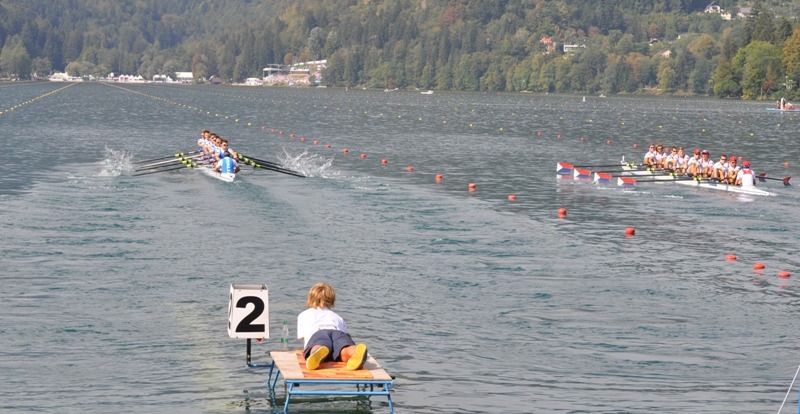 Each event qualifies a certain number of boats. So some of the fiercest racing could be for 5th place if the difference between 5th and 6th place means going to the Olympics or not. I think Erynn and I both remember the feeling of chanting "USA" with a few other people that day in Canada in 1999. So now at our 6th event we still have fun and make little vacations out of the trips. As you can see from all of these photos and from previous trips the experience is usually pretty amazing. And with the London Olympics next year the racing -- even in many of the B Finals -- was pretty exciting. But in the end it is inspiring to see all of the athletes at the peak of their form putting it all on the line. Knowing a tiny bit about what it takes to perform at this level brings nothing but respect from us. I hope you enjoy some of the rowing photos and possibly see the beauty in all of the hours of training and pain. People always ask why we go to these events. But we ask how can you not go? US Women's 8+ crossing the finish line for Gold! 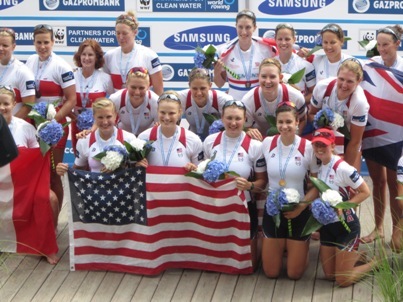 All of the full resolution rowing photos can be found here.